Even with a solid case and bullet-proof crystal, the Achilles heel of any watch is the winding stem. The winding stem is used to both set the watch’s time and date, as well as to power the mainspring. Unfortunately, the utilizing the winding stem opens the case to dust and potential water penetration. Even with a solid case, the crown and winding stem present opportunities for water and dust to enter the case, contaminate the sterile interior which eventually slows or stops the watch. As part of his Oyster case design, Hans Wilsdorf also patented the screw-in crown. The advantage of the screw in crown is the ability for it to seal against a rubber gasket. Although some crowns already possessed some type of rubber seal, the combination of a threaded stem compressing against a rubber o-ring made the seal much more water tight. 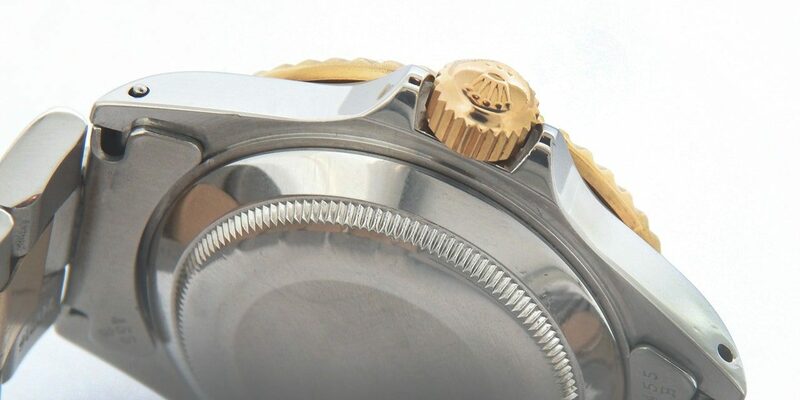 Rolex utilizes the closing of a submarine hatch as a metaphor for describing how the threaded crown works. Rolex has two type of crowns, depending on the water resistance required for the watch. The majority of the Rolex line utilizes the Twinlock Crown. The red in the image is where the rubber gaskets lie. Twinlock crown identifiable by a simple dash (-) or two dots (..) below the Rolex five pointed logo crown. The Twinlock crown is rated to be water tight to 100m/300ft. The Twinlock crown system has two rubber gaskets; one located inside the actual crown that compresses against the threaded tube attached to the watch case, and another rubber gasket that is located inside the watch tube. These two gaskets -one under compression from the watch crown, and another inside the tube encompassing the winding stem, prevents water and dust from penetrating the case. It has been noted that the gasket inside the watch tube keeps water from penetrating the case even when the crown is unscrewed. Despite this, it is important to keep the crown always screwed onto the case. Triplock uses two gaskets in the tube, one outside the tube, and one underside the crown. The second type of crown system Rolex utilizes is the TripLock system. Similar to the TwinLock system, Rolex utilizes 10 different components to insure water tightness to 1000ft/300meters with the TripLock system. TripLock crown is distinguishable by being larger than thea TwinLock crown, and they have three dots below the five pointed Rolex logo crown. The TripLock system utilizes a larger case tube, and four rubber o-ring gaskets to insure water tightness. The first gasket is viewable when the Triplock is unscrewed as it encompasses the outside of the winding tube, but is hidden just inside of the crown. Like the TwinLock crown, the second o-ring is inside the crown and is compressed against the case tube. The third and fourth gasket is located inside the case tube encompassing the winding stem. These four gaskets combined with a thicker threaded case tube insure water proofness to a depth greater that most amateur diver can descend. To ensure water proofness in a Rolex, be sure to keep the crown screwed down, and to have your Rolex pressure tested each year.